Ok I am going to try this but I have a question? The rules say you have 1 day? Is that 1 day as in day light hours in game or until the next mourning? I'm asking cause it might be a good idea to have some bones just in case I need some wood quick or food? Also Some one at the start keeping asking about why the trees were not growing. You have to have light and the area has to be 7 tall and wide I believe. you can check the wiki. When you dig into space, you get me, a galactic shovel. When you dig into the ground, you get an overworld potato. I made the chest just in case I was hunting I wouldn't lose my stuff. Didn't know if we would be allowed to turn Keep Inven on or not. My plan is to make the first hole in to the water the farm so I am going to make a 8*8 room and dig out the floor and plant wheat. then a mushroom farm, Mob farm, and a main room with chest for storage. Then i'll move to mining. Starting mob farm will be a 5*5 room with 1 door way. Putting half slabs at the top and bottom will stop light from entering and allow mobs to spawn as I mine. When I get iron i'll up grade to a water flow trap using half slabs at the end so I can kill for xp. I'll dig out a tree farm as part of my mining since I have wood for now. Digging my mine out I found a whole net work of caves under where I started my base. It lead to a mine shaft. Free wood and string but My spawning room will not work here cause there are to many caves near in the dark. Got my tree to grow. Going to expand over but with a mine shaft I don't know if really need it? I can clear out the wood and fence there and have plenty. Waiting on iron boots and then still to clear the place or I might wait till I have diamonds. The shaft is about 16 y. I will post the seed if anyone wants to try it. It spawns you in a swamp. Any suggestion on which to do first. I have heard spiders and since it is normal they will poison me. "Be successful by succeeding at successfully growing a single tree. Success!" Redundantly redundant sentence is redundant. Redundant! Fun! I'll start this today, and maybe me and some guys from MEP can do a multiplayer challenge on this. Thinking about using this challenge for a second season of my survival series Really well thought out! Xbox: Am I the only one who doesn't have one? Restarting the challenge because of my previous world corrupting and I just didn't want to restart. But now I will! Will edit with screenshots later. Already did some of it in Xbox. 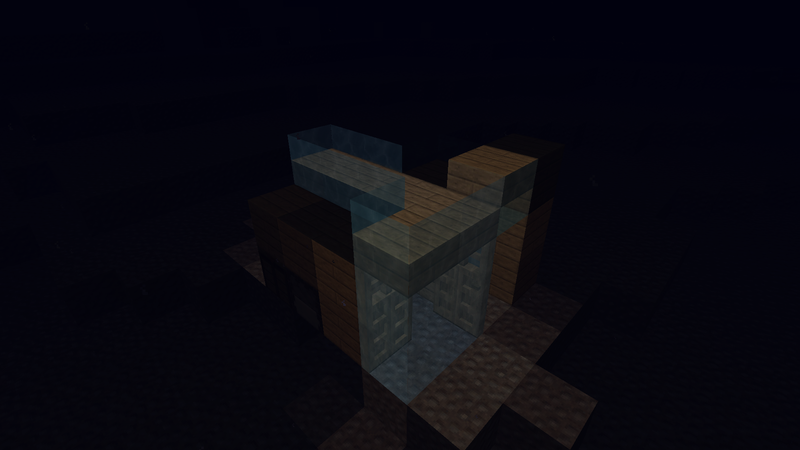 Gathered bunch of glass and made a glass dome under water in survival. I also made a fishing lake, so I think this is counted as a farm right? I cant seem to make a pigmen or enderman farm, any tips? I VOLUNTEER AS TRIBUTE, BRUH! Wait, WHERE THE HELL IS MY MC XBOX DISC? Have just went below surface with a glass dome.